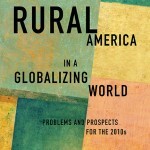 This fourth Rural Sociological Society decennial volume provides advanced policy scholarship on rural North America during the 2010s, closely reflecting upon the increasingly global nature of social, cultural, and economic forces and the impact of neoliberal ideology upon policy, politics, and power in rural areas. The chapters in this volume represent the expertise of an influential group of scholars in rural sociology and related social sciences. Its five sections address the changing structure of North American agriculture, natural resources and the environment, demographics, diversity, and quality of life in rural communities. The book is edited by Conner Bailey, Leif Jensen, and Elizabeth Ransom and published on West Virginia University Press, 2014. This entry was posted in Books on September 10, 2014 by admin.